There's a Card for That: Hawaiian Hibiscus Birthday | ft Close to my Heart "Hawaiian Hibiscus"
Hawaiian Hibiscus Birthday | ft Close to my Heart "Hawaiian Hibiscus"
Recently I have been playing around with my Copics and I've been looking for friendly inks that are not Memento. Don't get me wrong, I love my Memento ink and it is still my go-to for stamping images, but it is nice to know that there are options. As it turns out the water-based dye inks from Close To My Heart seem to be compatible. I haven't tried them all - I do have a lot of them, but the few that I have tried have worked nicely. To begin, I stamped the smaller hibiscus flower using CTMH's Whisper ink on 110lb Copic-friendly cardstock. I then masked that off and began building up more flowers and leaves around it. I removed all the masks and coloured the images in with Copic markers. I wanted to keep the lines soft. Despite the size of an actual hibiscus they feel very delicate to me. I didn't want anything harsh or "in your face" about this card. I stamped the Happy Birthday greeting from Lawn Fawn's "Party Animal" stamp set using the same soft grey ink. To finish it off I added clear Wink of Stella over the petals (once again it doesn't show up on camera, but I promise it is there). Then I mounted the panel on the front of a standard A2 sized card base. Wow...your hibiscus are so beautiful, love how you were inspired by the yellows. Stunning card. Thank you so much for playing along with us at Muse this week. A totally delightful floral creation, many thanks for joining us at Stamping Sensations challenge. A gorgeous floral design! Simply beautiful! 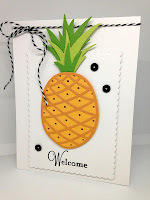 Thank you for sharing it with us at Stamping Sensations. Love the shading on your hibiscus, Trina! 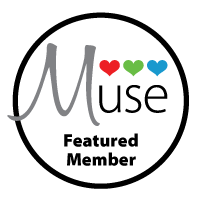 Thanks so much for joining us at Muse this week! Definitely feeling the Hawaii-vibe. Great interpretation of Kim's Muse card. Aloha!